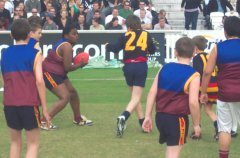 At half-time in the AFL Challenge match between West Coast Eagles and Fremantle Dockers at the Brit Oval in London earlier this month, it was time for the Lions and Crows to take the field. That was the Thamesbridge College Lions and the Kew College Crows. Also featured were juniors from Carshalton College and other schools. 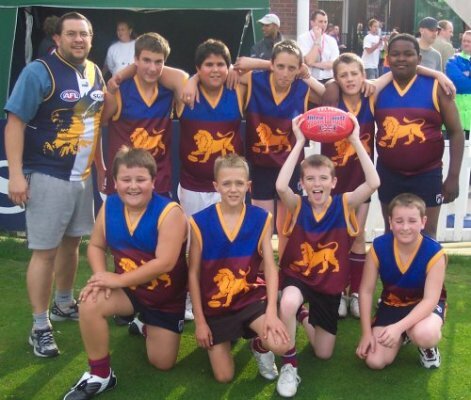 The Lions and Crows come from the Reading Roos area, and there will be a 4 team round robin Junior Reading League played before Reading Roos matches in the 2006 BARFL season. The BARFL is hoping to formalise their ad hoc junior programs into a Little League before most senior matches next year. The Roos have no problems with player numbers but are seeking sponsorship to help with kits, extra footballs etc (as always, volunteers or sponsors can reach clubs via their websites or through us). A second game involved Carshalton College who have previously been mentioned on WFN where they competed in the Aussie Rules tournament at the London Youth Games and a team composed of players from the other schools. Brian Clarke of Aussie Rules UK who supplied goalposts and some of the match equipment and umpired one of the matches, commented on the fantastic endeavour of the kids. The little league matches were reportedly real crowd pleasers, with most of the 19,000 pairs of eyes on the stars of the future. 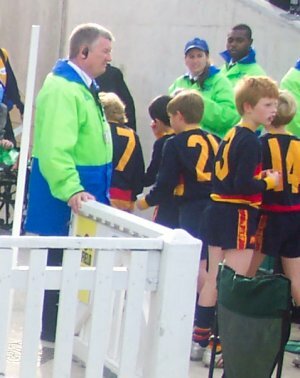 But for a description from the field of play, I will hand over to Liam Pyne of the Lions. Liam is holding up the footy in the team photo above, coach is Joao Coelho of the Reading Roos club. 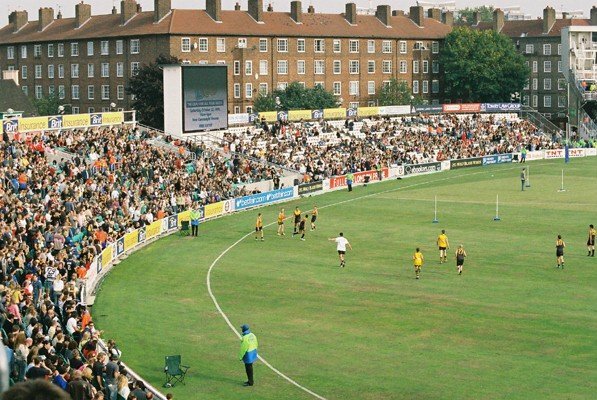 A few weeks ago some of the kids at Thamesbridge College went to the Oval to play Aussie Rules. When we got there the atmosphere in the stadium was amazing. The first game was between Great Britain and Ireland. Whilst this game was being played we were being shown around and shown where the changing room was. After we had seen where the changing rooms were we went to our balcony to watch the rest of the match. When the match was finished there was a small break before the other teams came out. The teams playing were The Eagles and The Dockers, when the Eagles came out the crowd went crazy and I decided that if the crowd cheered them on they must’ve been pretty good so I cheered them on too. We watched about 15 minutes of the first quarter then went and got changed into our kit. When we came back it was time to play our match. We came onto the pitch and the crowd gave us a massive cheer. The match began and the other team scored first so our morale dropped a bit but we carried on playing and were rewarded with a goal, then we scored again to make it 12-6. We carried on going and scored again and again but the second time we scored it was only 1 point because they got a touch on it before it crossed the line, so it made the score 19-6. Chasing the ball around was fun as the crowd cheered us on and we scored 2 more times and won the game 31-6. When we left the pitch we were exhausted, but we wanted to play more. Before we left the pitch we had our picture taken as a team. We went back to the changing room and got changed, then we went to the gift shop and looked in it. We went back to the balcony and watched the end of the match. The Eagles lost in the end, but at least we won!!! !